Edmonton experiences extremely low temperatures and subsequent fluctuations or sudden rise and dip in temperatures will be prone to ice damming. Ice damming is a phenomenon associated with the roofs in residential as well as commercial properties. The fluctuating temperatures during winter lead to a freeze-thaw cycle. The cycle is characterized by sudden melting of the accumulated snow on the roof and then sudden freezing of the water that has resulted from the melting of the snow or ice. 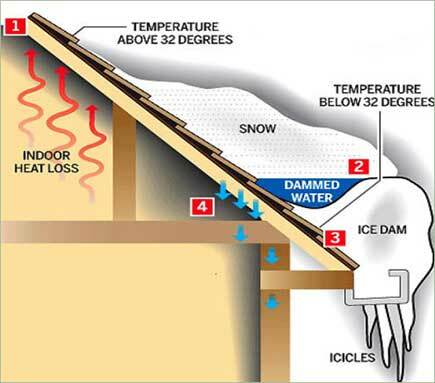 The phenomenon of ice damming is extremely harmful for the roof, the attic and the floor directly beneath it. Ice damming can cause damage to the structural integrity of the roof, can completely destroy the insulation that you have, it will facilitate the growth of mold and will interfere with the ventilation process. Fortunately, there are ways of preventing ice damming. Here is a quick guide on preventing ice damming. Your attic must be ventilated properly. If you can allow cool, dry air to come in through the vents or soffits, then you can prevent ice damming. What this will do is the temperature in the attic will remain relatively steady and it will be fresh, avoiding any humidity build up inside. 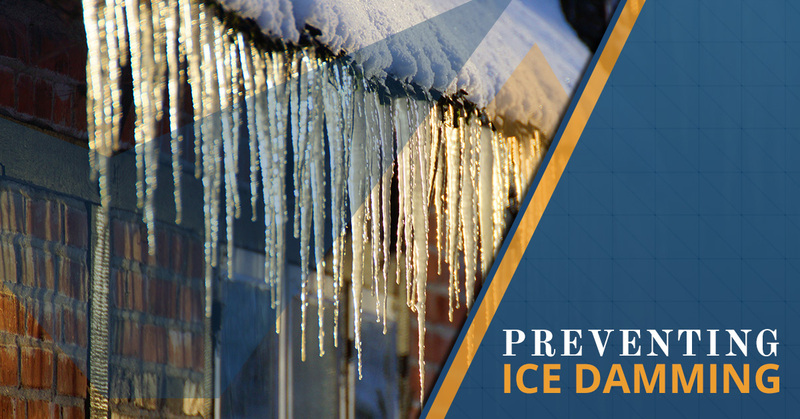 With good ventilation, ice damming can be prevented. Ice damming occurs for many reasons and the fluctuating external temperatures is not the only one. One of the first steps of preventing ice damming is to ensure that you have impeccable insulation. What happens during temperature fluctuations is that the heat from within the house or property dissipates out and that causes the lowermost deposits of snow or ice to melt. It is not the external temperature that leads to the melting because that is shielded by the top sheaths of deposits of snow. If you can protect the heat from dissipating out from your property, then you can prevent ice damming. Another very effective way to prevent ice damming is to prevent the buildup of ice or snow on the roof. That takes care of the problem right at its roots. Whenever there is some deposit of snow or ice, you can use a roof rake and pull down all the snow from the roof. You must be careful with the process so you don’t damage the roof or the shingles. You can hire a professional to do this for you. You must take a multipronged approach for preventing ice damming. No one way will be enough to combat or to prevent the problem.